Road racers Maria Costello and Peter Hickman join MCE Insurance's Big Ed plus Ken Stewart and Noel Johnston of the Dundrod and District Motorcycle Club to announce the title sponsorship of the race in Northampton. 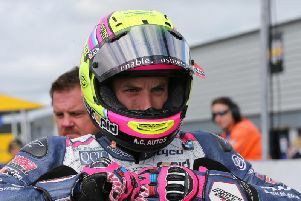 The Ulster Grand Prix has secured a high-profile title sponsor after confirming a three-year deal with MCE Insurance. The independently owned motorcycle insurance company is well known within racing circles as the flagship backer of the prestigious British Superbike Championship. Tuesday’s announcement means the world’s fastest road race at Dundrod will be known as the MCE Insurance Ulster Grand Prix until 2018 at least. Clerk of the Course Noel Johnston said the significant tie-up with the UK and Ireland’s leading motorcycle insurance company would enable the organising Dundrod Club to enhance its profile as one of the greatest international road race meetings in the world. “We are truly delighted to make this major announcement, which marks the beginning of an exciting new chapter for the Ulster Grand Prix,” Johnston said. “We’ve seen and been impressed by the support MCE Insurance has offered the BSB in the past eight years. Johnston said the company’s decision to commit to a three-year package was a vote of confidence in the future of the legendary race. “For us, MCE’s decision to commit to a three-year deal is a clear demonstration of confidence in the strength of our event, which undoubtedly offers some of the most thrilling racing seen anywhere on the roads, and its ability to offer significant exposure and value to its partners,” he said. “It goes without saying that there would be no event without the support of our stakeholders and this is an opportunity for us to thank MCE for getting involved, as well as organisations such as Lisburn & Castlereagh City Council, Tourism NI and the Ulster Grand Prix Supporters Club, plus a wide range of private sector sponsors for their ongoing support,” Johnston added. MCE’s Chief Executive Officer, Julian Edwards, said the opportunity to become involved with the historic Ulster Grand Prix was one that he couldn’t refuse. “We are incredibly proud to finally release the news that we will be the title sponsor for the MCE Insurance Ulster Grand Prix,” he said. “We have been interested in sponsoring a road racing event over in Ireland ever since we began offering insurance for Irish bikers back in 2014. “When the opportunity at the Ulster came up it was one we just couldn’t refuse. With such an incredible history, the event truly is a jewel in the road racing calendar,” Edwards added. “We intend to bring all our experience gained over nearly a decade of sponsoring the MCE British Superbike Championship and very much look forward to working with the Ulster Grand Prix team. The exciting news comes hot on the heels of plans to introduce a Superpole qualifying session at Dundrod this year in a first for an international road race meeting. The fastest 12 riders in Superbike practice will progress to Superpole on the Thursday of Bike Week, when they will take to the 7.4-mile course to stake their claim for pole position in what is sure to be an intriguing showdown. Johnston said: “As our recent decision to introduce a Superpole qualifier for the Superbike class shows – for the very first time in road racing – we are working hard behind the scenes to deliver another spectacular week of racing this August. The 2016 MCE Insurance Ulster Grand Prix will take place between August 8-13 at Dundrod. The key events include the Dundrod 150 National meeting on Thursday, August 11 and the feature Ulster Grand Prix on Saturday, August 11. Practice will take place on Wednesday and Thursday, August 10-11, with a full programme of entertainment laid on each night in the hospitality marquee in the paddock. General admission wristbands and tickets for the Joey Dunlop Grandstand are now on sale via Ticketmaster. To book visit www.ticketmaster.co.uk or visit www.ulstergrandprix.net for more details. Wristbands can also be purchased in the traditional way on practice and race days at the usual places around the course.